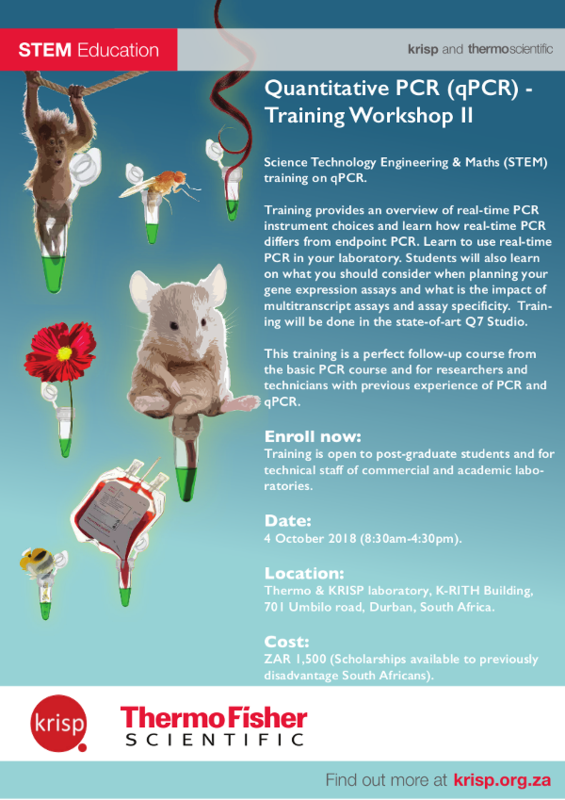 Science Technology Engineering and Maths (STEM) training II on quantitative PCR (qPCR). Thermo-KRISP Lab, Nelson Mandela School of Medicine, UKZN, Durban, South Africa, 4 October 2018. Training is open to post-graduate students and for technical staff of commercial and academic laboratories. - Download application form (deadline for application 15 September 2018). Training provides an overview of real-time PCR instrument choices and learn how real-time PCR differs from endpoint PCR. Learn to use real-time PCR in your laboratory. Students will also learn on what you should consider when planning your gene expression assays and what is the impact of multitranscript assays and assay specificity. Train- ing will be done in the state-of-art Q7 Studio. This training is a perfect follow-up course from the basic PCR course and for researchers and technicians with previous experience of PCR and qPCR.